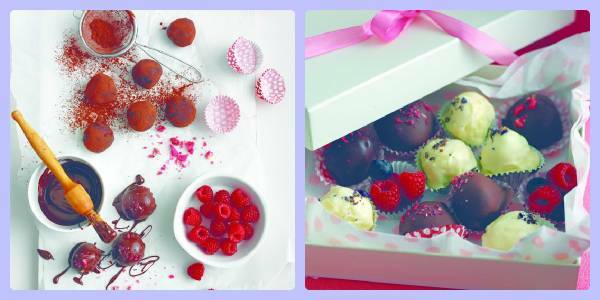 Chocolate truffles with a surprise raspberry center to melt even the most unromantic of hearts. Pour the cream into a small saucepan, bring just to the boil then take off the heat and add the chocolate pieces. Set aside for 5 minutes or so until the chocolate has melted. Add the sugar and brandy or kirsch and stir until smooth. Leave to cool then transfer to the fridge for about 3 hours until firm. Scoop teaspoons of the truffle mixture on to baking sheet and continue until you have 24 mounds, all about the same size. Make a dip in the centre of each, add a raspberry then press the truffle mixture around the raspberry to enclose it completely. Next roll them between two hands dusted with sifted cocoa powder to get an even round shape. Return the truffles to the fridge to chill for 1 hour or so until firm. Add the dark chocolate pieces to a bowl and set this over a saucepan of very gently simmering water so that the bowl stands above the top of the pan and the base of the bowl is not touching the water. Heat for about 5 minutes until the chocolate has just melted. Take the bowl off the pan then slide the prongs of a fork under one of the truffles, and hold this over the melted chocolate. Using a teaspoon, spoon a little of the melted chocolate over the top to cover completely. Slide off the fork on to a baking sheet lined with non-stick baking paper. Continue until all the truffles have been coated, and sprinkle with tiny pieces of crystallised rose petals or glitter flakes. Chill for about 30 minutes or until firm, then transfer the truffles to petit four cases and pack into a box lined with tissue paper or non-stick baking paper. Add the lid and tie with ribbon. Keep in the fridge and eat within 3 days. Make in just the same way as the dark chocolate and raspberry truffles. 3 tablespoons Cointreau or Grand Marnier. There is no need to add sugar as white chocolate is sweeter. Chill the truffle mix until firm – this may take longer than dark chocolate truffles, and if still a little soft after 3 hours just whisk the mixture briefly to thicken. Divide the cooled truffle mixture around 100g (4oz) large blueberries instead of the raspberries, dusting hands with icing sugar. Chill well then coat in 200g (7oz) melted white chocolate and decorate with tiny pieces of crystallised violet petals or edible sugar glitter. For a speedier decoration simply roll the shaped truffles in grated white chocolate. Chill once more until firm and arrange in petit four cases in a tissue lined box for your Valentine. What I Wore : Snow Week! !….